Long before Robert Redford and Leonardo DiCaprio played F. Scott Fitzgerald’s great American striver Jay Gatsby, another iconic blond pretty boy tackled the role. I first saw Elliott Nugent’s version of The Great Gatsby in 2012 as part of Noir City 4 at The Music Box Theatre. Although in the lobby after the screening I overheard one audience member very angrily denounce the film as “not noir in any way,” and I couldn’t disagree, it’s not a bad film and I’m glad I saw it. 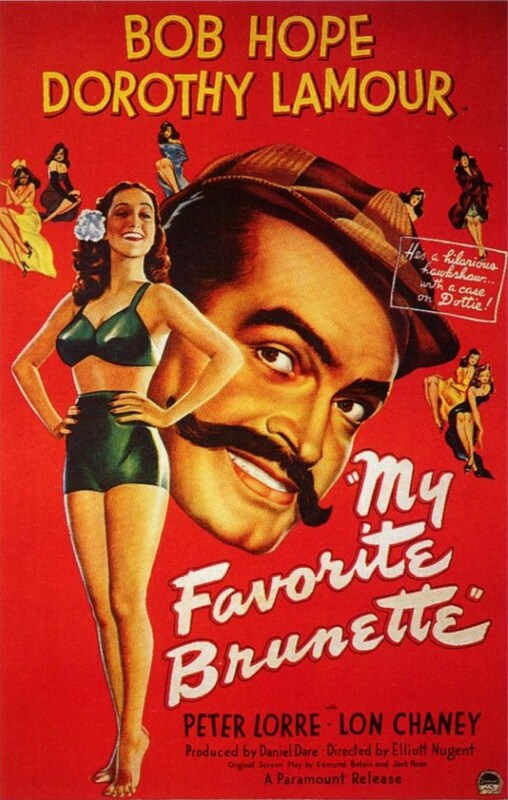 At one point, both Gene Tierney and Tyrone Power were attached to the project. According to several websites, Tierney was deemed “too beautiful” to play Daisy Buchanan by both Nugent, the director, and Richard Maibaum, the producer, but none of those websites have a source for that claim. Personally, it seems an insane reason not to cast an actress as Daisy Buchanan. She’s the unattainable object of Gatsby’s romantic longing. Whether or not she’s really the most beautiful woman in West Egg, Long Island, is immaterial. Film is a visual medium and a beautiful actress playing Daisy just makes sense. Betty Field, who plays Daisy in this film, is attractive, but she possesses none of the ethereal beauty of an actress like Tierney. Also, I can think of no better actress than Tierney to project outward beauty coupled with inward emptiness and callousness. Alan Ladd, however, makes a better Jay Gatsby than I imagine Tyrone Power would have. Ladd was a handsome actor whose understated persona was always somewhat unknowable. Viewers could project whatever they wanted onto him. Because of this, Ladd is perfect as Gatsby, the bootlegger who single-mindedly built a fortune and passed himself off as a man who came from money. Gatsby’s outward appearance was perfect, but like the beautiful books in his study, which all have uncut pages, there is nothing behind the façade. The early parts of the film play up Gatsby’s early days in organized crime, exploiting Ladd’s facility with gangster movies and film noirs. Eventually, though, the film settles into a talky version of the novel that is largely drawn from Owen Davis’s stage adaptation that opened in 1926 and ran for 112 performances. As I said, it’s not a bad film, but it’s not a particularly compelling one. Ladd is a good Gatsby, and the other performers are generally fine. I liked Barry Sullivan as Daisy’s husband Tom and loved Shelley Winters as Tom’s mistress Myrtle. The film is at its best when it most resembles a hard-boiled noir, but those moments are few and far between. The biggest flaw, of course, is that it’s a straightforward and very literal adaptation of a great American novel, and possesses none of Fitzgerald’s elegant prose. It’s worth seeing, but far from a masterpiece. It’s a great example of why the phrase “the book was better” became a cliché. 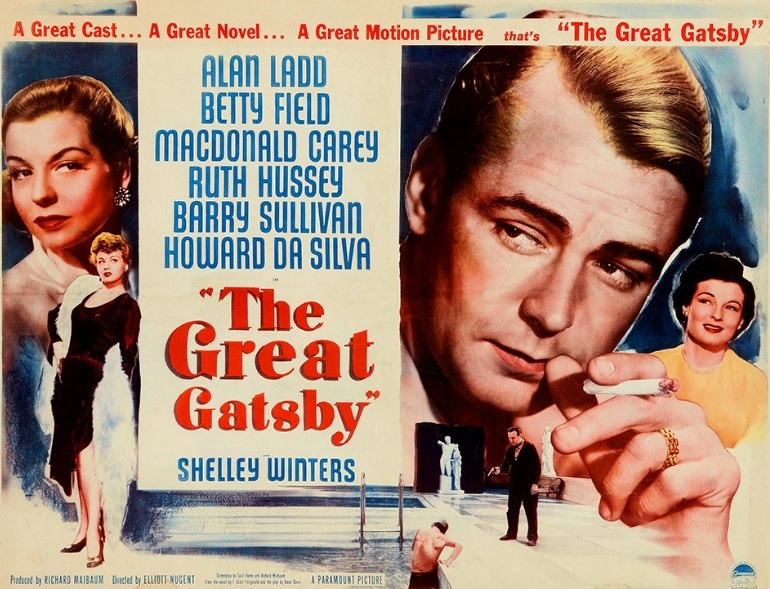 Posted in 1949, July 1949 and tagged Alan Ladd, Barry Sullivan, Betty Field, Elliott Nugent, F. Scott Fitzgerald, Macdonald Carey, Owen Davis, Paramount Pictures, Shelley Winters, The Great Gatsby. Bookmark the permalink.